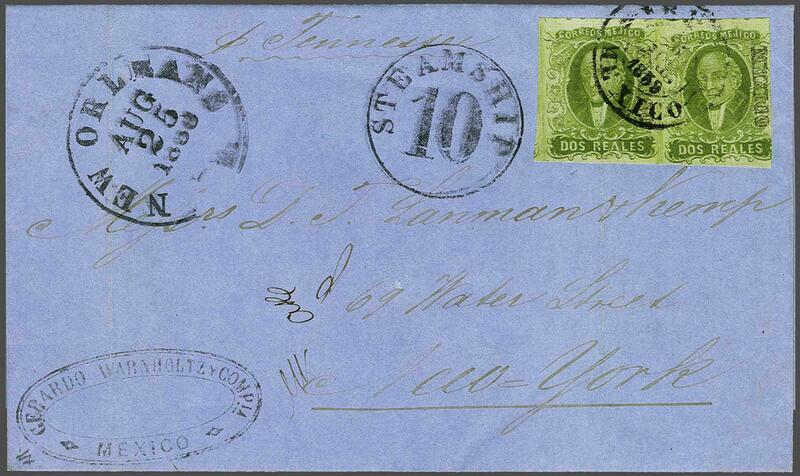 1856: 2 r. green, District Mexico, a fine horizontal pair used on 1859 entire letter from Mexico City to New York endorsed 'p. Tennessee' tied by 'Franco / Mexico' cds in black (July 16). NEW ORLEANS transit cds (Aug 25) in black and circular STEAMSHIP / 10 in black. Left hand stamp of pair crossed by light file fold but a rare Overseas usage of the first issue.